Hopkins (shoulder) isn't worried about his health and says he's excited to work with new offensive coordinator Tim Kelly, Aaron Wilson of The Houston Chronicle reports. "Oh man, I'm good," Hopkins said. "I got a long time until our next game, so I'll be fine." Hopkins decided to withdraw from the Pro Bowl on Wednesday due to a shoulder injury, Pat McManamon of ESPN.com reports. Analysis: Hopkins was banged up entering Houston's wild-card loss to Indianapolis and went on to sprain the AC joint in his right shoulder before the final whistle. It's no surprise he'll drop out of the Pro Bowl in favor of rest. Cleveland's Jarvis Landry will take Hopkins' spot. Hopkins said he suffered a Grade 3 AC joint sprain in his right shoulder during Saturday's 21-7 loss to the Colts, James Palmer of NFL Network reports. Analysis: Hopkins' ability to play through such an injury indicates a certain level of pain tolerance. While he finished the game with five catches (on 10 targets) for 37 yards, he managed a 2-11-0 line on five looks after picking up the issue late in the first half. Hopkins will have the entire offseason to get healthy, but may be hard-pressed to fulfill his election to the Pro Bowl starting lineup on Jan. 27. Despite being a limited participant again Thursday, Hopkins (ankle) does not carry an injury tag into Saturday's wild-card game against the Colts. Analysis: Hopkins has made a habit of being limited in practice throughout the season for various reasons, but it hasn't prevented him from missing a game yet this season. He should be all systems go for the Texans' wild-card game and will look to continue a stretch of three straight games with at least nine catches and 100 receiving yards. He has faced the Colts twice already this season, notching a touchdown in each game while combining for 14 grabs and 200 receiving yards. Hopkins (ankle) practiced on a limited basis Wednesday, Aaron Wilson of the Houston Chronicle reports. Analysis: Hopkins was a limited participant in the vast majority of practices during the regular season, typically listed with either a foot, ankle or thumb injury or some combination of those issues. He should be fine for Saturday's playoff game against a Colts team that allowed him to rack up 14 catches for 205 and two scores over 22 targets in teams' previous two matchups. Hopkins (ankle) is listed as a limited participant on the Tuesday injury report. Analysis: Consistently listed on the injury report, Hopkins never actually came close to missing a game this season. He caught 14 of 22 targets for 205 yards and two touchdowns in two matchups with the Colts during the regular season, doing most of that damage in the first meeting back in Week 4. He figures to stay busy during Saturday's playoff game. Hopkins caught 12 of 16 passes for 147 yards during Sunday's 20-3 win over the Jaguars. Hopkins (ankle) doesn't have a designation for Sunday's game against the Jaguars. Analysis: After maintaining a limited standing on Texans injury reports all week, Hopkins was cleared to suit up as he normally does on gameday. In his first matchup of the season with the Jags in Week 7, he compiled three catches (on eight targets) for 50 yards and one touchdown. However, Jacksonville's defense will be without No. 2 cornerback A.J. Bouye (toe), which could open up more opportunities for Hopkins. Hopkins (ankle) was a limited participant in Thursday's practice. Analysis: Hopkins might not be cleared for full participation Friday in the Texans' final practice of the week, but there doesn't seem to be any real concern for his status for Sunday's game against the Jaguars. After first tweaking his ankle in the Week 15 win over the Jets, Hopkins took a questionable designation into the Week 16 loss to the Eagles, but ultimately played every snap of the contest and finished with nine receptions for 104 yards. Hopkins (ankle) was limited at practice Wednesday. Analysis: There was some intrigue regarding Hopkins' Week 16 status, but the wideout was on the field for all 65 of the Texans' offensive snaps in the team's 32-30 loss to the Eagles, finishing with nine catches for 104 yards on 12 targets. With no setbacks in that contest, it seems safe to assume that Hopkins' limitations Wednesday were maintenance-related. Hopkins caught nine of 12 targets for 104 yards in Sunday's 32-30 loss to Philadelphia. Analysis: Hopkins battled an ankle issue during the week, but he was able to turn in his second straight 100-yard effort. However, it marked just the second time this season that the 26-year-old had back-to-back 100-yard games. Unfortunately, he was held out of the end zone for the first time in three weeks. The Clemson product has a tough test Week 17 at home against Jacksonville, against whom he caught just three passes for 50 yards and a touchdown in Week 7. Hopkins (ankle) is active for Sunday's game against the Eagles. Analysis: A true game-time decision heading into the day, Hopkins gained clearance to play after completing a pregame workout without any apparent issues. With the Texans still jockeying for playoff positioning, Hopkins should be in store for a normal snap count while filling his usual high-volume role in the Houston aerial attack. Hopkins (ankle) is in line to play Sunday against the Eagles, James Palmer of NFL Network reports. Analysis: Per the report, the wideout -- who had been on the field testing out his ankle -- indicated to Palmer that he'll be good to go Sunday, an anticipated outcome that will be confirmed either way once the Texans' inactives are released in advance of team's 1:00 ET kickoff. Hopkins (ankle), who is listed as questionable for Sunday's game against the Eagles, expects to play, but will go through a pregame workout before the Texans decide on his fate, a source told Ian Rapoport of NFL Network. Hopkins (ankle) is listed as questionable but is expected to play Sunday against the Eagles, Aaron Wilson of the Houston Chronicle reports. Analysis: Seeing Hopkins on the injury report heading into the weekend raises an eyebrow, but the standout wide receiver has played through several nicks all season. His presence on the field becomes more important this weekend, when the Texans' sixth-ranked rushing offense could be without starting running back Lamar Miller, who is questionable due to an ankle injury. Hopkins (ankle) is listed as questionable for Sunday's game against the Eagles after practicing in a limited fashion Wednesday through Friday. Analysis: The designation implies that Hopkins, who has been a regular on the injury report all season but has yet to miss a game, is a bit more banged up than usual. Still, it would be quite surprising if he didn't suit up this weekend, with his active status a likely outcome that will be confirmed in advance of the first wave of kickoffs Sunday. Assuming he plays, Hopkins -- who has been targeted 33 times over his last three outings -- will be in line to handle a high-volume role in the Houston offense. Hopkins (ankle) was listed as a limited practice participant Wednesday. Analysis: Hopkins' ability to practice Wednesday puts him on the right track in advance of Sunday's game against the Eagles. It remains to be seen, however, if the Texans' top wideout ends up listed as questionable come Friday or enters the weekend minus an injury designation. Hopkins (ankle) practiced Wednesday, Aaron Reiss of The Athletic reports. Analysis: Hopkins rolled his ankle in Saturday's win over the Jets, but his presence at practice Wednesday is a good sign with regard to his availability for Week 16 in Philadelphia. Look for the wideout to be officially listed as limited on Wednesday's injury report. Hopkins injured his ankle during Saturday's win over the Jets, Aaron Wilson of the Houston Chronicle reports. Hopkins caught 10 of 11 targets for 170 yards and two touchdowns in Saturday's win over the Jets. Hopkins (foot) does not carry an injury designation for Saturday's game against the Jets. Analysis: Hopkins continues to be limited at practice, but as usual, he'll be out there on game day and on track to maintain his high-volume role in the Houston offense. He'll take aim at a Jets squad that snapped a six-game slide with a 27-23 win over the Bills this past Sunday. Hopkins (foot) was limited at practice Wednesday. Analysis: Hopkins has been a fixture on the Texans' injury reports all season, routinely logging limited practices but never in any real peril of missing game action. Look for the Texans' top wideout to head into Saturday's game against the Jets minus an injury designation when the team submits its final report of the week. Hopkins (foot) was a limited participant at Tuesday's walkthrough. Analysis: Hopkins has been a staple on the Texans' injury reports all season but has yet to miss a game. The 26-year-old will likely be limited at practice the rest of the week, but unless he suffers a setback, he's expected to suit up for Saturday's game against the Jets. Hopkins caught four of 10 targets for 36 yards and a touchdown in Sunday's 24-21 loss to the Colts. Analysis: Hopkins redeemed his season-worst yardage total by reeling in a seven-yard touchdown late in the fourth quarter to bring the Texans within three. 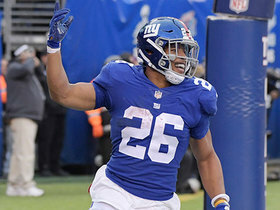 The 26-year-old had not failed to reach 50 yards in any prior game this year, but he was happy to score for the first time in three contests. He has a much more appealing matchup on the road Week 15 against the Jets. Hopkins (foot) doesn't have an injury designation for Sunday's game against the Colts, Aaron Wilson of the Houston Chronicle reports. Hopkins (foot) was listed as a limited practice participant Wednesday. Analysis: The listing is nothing out of the ordinary for Hopkins, who has been a fixture on injury reports all season but has yet to be truly in any danger of missing game action. The expectation is that Hopkins will approach this weekend's game against the Colts minus an injury designation, an outcome that should be confirmed Friday. Hopkins caught seven of 12 targets for 91 yards in Sunday's 29-13 dismantling of the Browns. Hopkins (foot) doesn't carry an injury designation into Sunday's game against the Browns. Hopkins (foot) was a limited participant in Thursday's practice. Analysis: The Texans have managed Hopkins' practice reps carefully all season while he's been listed on the injury report with a variety of minor issues, but the wideout has never been in serious danger of missing any game action. Hopkins' status for Sunday's tilt with the Browns shouldn't be viewed as a concern as he looks to bounce back after having his five-game touchdown streak snapped in the Week 12 win over the Titans. 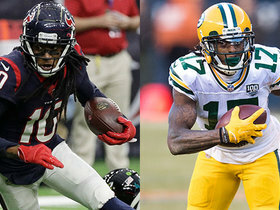 Hopkins (foot) was listed as a limited practice participant Wednesday, Aaron Wilson of the Houston Chronicle reports. Analysis: Hopkins was on the field for all but one of the Texans' 65 offensive snaps in the team's Week 12 win over the Titans. With no reported setbacks in that game, it's assumed his involvement in practice was limited for maintenance purposes. The wideout will likely be removed from the Texans' injury report before the end of the week and should be ready to fill his usual high-volume role in the passing attack Sunday against the Browns. Hopkins caught five of six targets for 74 yards in Monday night's 34-17 win over the Titans. Analysis: Hopkins led Houston in all major receiving categories, although it was new teammate Demaryius Thomas who scored both of the team's touchdowns through the air. While that broke Hopkins' streak of five straight games with at least one touchdown, he still topped 70 yards for the eighth time this season, making a handful of catches along the way. The All-Pro wideout will now look forward to a Week 13 matchup against the Browns. Hopkins (foot) won't carry an injury designation into Monday's game against the Titans. Analysis: Hopkins was a limited practice participant again Saturday but the Texans appear to simply be limiting his practice reps. The 26-year-old has dealt with the foot issue for much of the season but will continue to play through it for Monday's divisional tilt. Hopkins (foot) was listed as a limited practice participant Friday. Analysis: That was also the case Thursday, but come Saturday, it seems likely the Texans' top wideout will approach Monday night's game against the Titans minus an injury designation on Hoston's final Week 12 injury report. Hopkins (foot) was listed as a limited practice participant Thursday. Analysis: Hopkins was on the field for all 63 of the Texans' snaps on offense in Week 11's win over Washington. With no reported setbacks in that game, we'll operate under the assumption that his listed imitations Thursday were maintenance-related. Hopkins caught five of six targets for 56 yards and a touchdown while losing a fumble in Sunday's 23-21 win over Washington. Analysis: Hopkins scored from 16 yards out in the first quarter to extend his touchdown streak to five games. The physical wideout is among the league's most dangerous players near the goal line, with 21 receiving scores since the start of last season. Deploy him as you usually would against the Titans in Week 12. Hopkins (foot) doesn't have an injury designation for Sunday's game against Washington. Analysis: Hopkins played all but one of the Texans' 62 offensive snaps in the team's last game in Week 9 against the Broncos, hauling in 10 of his 12 targets for 105 yards and a touchdown. With no reported setbacks in that contest, Hopkins should be fine for Sunday's game against Washington, especially after he had a Week 10 bye to heal up from the foot issue. Hopkins amassed 10 receptions for 105 yards and one touchdown during Sunday's 19-17 victory against the Broncos. Hopkins (foot) doesn't carry an injury designation into Sunday's game against the Broncos. The Texans listed Hopkins (foot) as a limited participant at Thursday's practice. Hopkins (foot) was limited at Wednesday's practice. Hopkins brought in six of seven targets for 82 yards and two touchdowns in the Texans' 42-23 win over the Dolphins on Thursday. 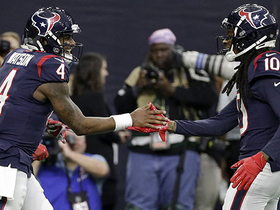 Analysis: Hopkins and Deshaun Watson continued their prolific connection Thursday, touching up a hapless Dolphins secondary for a pair of second-half touchdown catches. The 26-year-old Pro Bowler has now found the end zone on four occasions over his last three contests, turning a trio of sub-100-yard performances into productive fantasy efforts in the process. Hopkins is now averaging 6.6 receptions and 98.6 yards per contest heading into a Week 9 matchup against the Broncos. Hopkins (foot) doesn't have a designation on the Texans' final injury report for Thursday's game against Miami. Analysis: Hopkins was listed as a limited participant all week, but there was never any question about his availability against MIami. He'll face a defense that's given up just five scores to wide receivers in seven games, albeit while surrendering 9.4 yards per target. Hopkins (foot) was listed as a limited participant at Tuesday's walkthrough. Analysis: Hopkins has dealt with the foot injury at various points throughout the season but has yet to miss any games. The 26-year-old is likely to remain limited again Wednesday, but at this point there's nothing to suggest his availability for Thursday's game against the Dolphins is in question. Hopkins (foot) was limited at Monday's walk-through, the Texans' official site reports. Analysis: Hopkins has carried a foot injury with him at various points in the season, only to brush it off by gameday. Although his weekly target count has fallen to the single digits the past two games, he salvaged his day both times by reaching the end zone. Don't be surprised if Hopkins remains limited all week in advance of Thursday's game against the Dolphins. 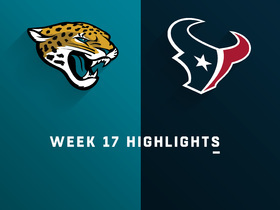 Hopkins brought in three of eight targets for 50 yards and a touchdown in the Texans' 20-7 win over the Jaguars on Sunday. Hopkins (foot) doesn't carry an injury designation into Sunday's game against the Jaguars after logging a limited practice Friday. Analysis: Keke Coutee (hamstring) and Will Fuller (hip) are also free of Week 7 injury designations, meaning that the Texans will have their top three pass catchers available Sunday. Hopkins is thus set to maintain his key role in the team's passing attack, a context that has yielded a team-high 44 catches to go with 657 receiving yards and three touchdowns through six contests. Hopkins (foot) did not practice Thursday, Sarah Barshop of ESPN.com reports. Analysis: On Wednesday, Hopkins joined Keke Coutee (hamstring) and Will Fuller (hip) as limited participants. While his fellow wideouts maintained that level of work Thursday, Hopkins was downgraded to "did not participate." It remains to be seen if that is indicative of a setback, or simply a case of the high-volume pass-catcher getting a maintenance day. Added clarity on that front will arrive no later than Friday, upon the release of the Texans' final Week 7 injury report. Hopkins (foot) was a limited participant at Wednesday's practice. Analysis: Hopkins was listed with the same injury last week before suiting up Sunday in a 20-13 win over the Bills and catching five of six targets for 63 yards and a touchdown. His presence on the injury report has become a non-issue, but the same can't be said about his Week 7 matchup with Jacksonville. 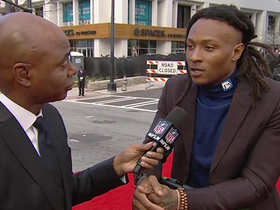 Hopkins will likely draw plenty of attention from All-Pro cornerback Jalen Ramsey throughout the day. Hopkins secured five of six targets for 63 yards and a touchdown in the Texans' 20-13 win over the Bills on Sunday. He also attempted a pass that fell incomplete. Analysis: Hopkins paced the Texans in both receptions and receiving yardage, and he also was responsible for the team's only offensive touchdown. The Pro Bowler faced a tough matchup against Tre'Davious White, which likely limited his overall production, as did the fact that quarterback Deshaun Watson was playing with both rib and lung injuries. However, Hopkins remains an elite play in any format heading into a tough Week 7 matchup against the Jaguars. Hopkins (foot) does not carry a Week 6 injury designation after practicing in a limited fashion all week. Analysis: The same applies to Keke Coutee (hamstring) and Will Fuller (hamstring), meaning that the Texans will have their top three pass catchers available Sunday against the Bills. Deshaun Watson (chest) is listed as questionable for the contest, but we'd be surprised if he didn't play. Hopkins has been a steady high-volume option through Houston's first five games en route to accumulating 39 catches on 57 targets for a league-high 594 yards and two TDs. Hopkins (foot) was a limited participant at Thursday's practice. Analysis: The Texans have restricted Hopkins' reps throughout the season, but his availability for any of the team's five games has never truly been in peril. With no indication from the Texans that his latest foot injury is a particularly concerning matter, Hopkins should be in store for another double-digit target count Sunday against the Bills. Hopkins (foot) was listed as a limited participant at Wednesday's practice. Analysis: The same limited listing applies to fellow wideouts Keke Coutee (hamstring) and Will Fuller (hamstring). That said, Hopkins was on the field for all 80 of the Texans' offensive snaps in the Week 5 win over the Cowboys and reported no injury coming out of the contest. It's thus suspected his limitations Wednesday were mainly maintenance-related. Hopkins caught nine of 13 targets for 151 yards during Sunday's 19-16 overtime victory over the Cowboys. He also lost a fumble. Hopkins (thumb/ankle/hamstring) doesn't carry an injury designation heading into Sunday's game against the Cowboys. Analysis: Though he was a limited participant in practice throughout the week, none of the three injuries Hopkins is nursing were considered serious enough to threaten his status for Week 5. The wideout has earned double-digit targets in all four of the Texans' games this season, netting a combined 30 receptions for 443 yards and two touchdowns. He'll once again remain an elite fantasy play this weekend. Hopkins (thumb/ankle/hamstring) was a limited participant during Thursday's practice. Hopkins (thumb/ankle/hamstring) was a limited participant at Wednesday's practice. Analysis: Hopkins was a limited participant all last week with the same trio of injuries, eventually suiting up in Sunday's overtime win over the Colts and finishing with 10 catches for 169 yards and a touchdown on 12 targets. With no report of a setback, he should be fine to face the Cowboys in Week 5. Hopkins was targeted 12 times and converted them into 10 catches for 169 yards and a touchdown during Sunday's 37-34 win over the Colts. Analysis: Hopkins hauled in a five-yard fade for the Texans' third touchdown of the game just before halftime. It was Hopkins' second score of the season. Though he faces a tough Dallas defense Sunday, Hopkins remains one of the most reliable receivers in the game. He has been targeted at least 10 times, caught at least six passes, and tallied at least 70 yards in every game thus far this season. His star appears to be rising as Deshaun Watson gets closer to 2017 form. Hopkins (thumb/ankle/hamstring) is active for Sunday's game against the Colts. Analysis: Though the combination of injuries resulted in Hopkins entering the weekend with a questionable tag, the wideout was never in serious peril of missing the divisional matchup. Hopkins appeared on the Texans' injury report a week ago with the same list of issues, but ultimately suited up in the Week 3 loss to the Giants, logging all 68 of the team's offensive snaps and finishing with six receptions for 86 yards on 10 targets. Another healthy snap and target count likely awaits him Sunday. Hopkins (thumb/ankle/hamstring), who is questionable for Sunday's game in Indianapolis, is expected to play, Ian Rapoport of NFL Network reports. Analysis: The combination of injuries has limited Hopkins' practice time the last few weeks, but he has yet to miss a game or see his snap counts suffer as a result. Even though he may enter the weekend at less-than-full health, there was never any serious question about his availability for the divisional matchup. Hopkins should once again make for an elite fantasy play against a Colts defense that has allowed opponents to complete 71.2 percent of passes for 7.1 yards per attempt through three games. Hopkins (thumb, ankle, hamstring) is listed as questionable for Sunday's game against the Colts after practicing in a limited fashion all week, Sarah Barshop of ESPN.com reports. Analysis: Given that he practiced all week -- albeit in a limited capacity -- we'd be surprised if Hopkins weren't active this weekend. Fortunately for those inclined to utilize the target-gobbling wideout in Week 4 lineups, the Texans kick off at 1:00 PM ET on Sunday. Hopkins was a limited participant at Wednesday's practice due to thumb, ankle and hamstring injuries, Aaron Wilson of the Houston Chronicle reports. Analysis: There's no reason to believe any of the three injuries are serious, considering Hopkins has been on the field for all but one snap through the first three games of the season, drawing either 10 or 11 targets in each contest. He was listed with the same assortment of injuries last week, logging limited practices sessions Wednesday through Friday before being removed from the final injury report. Hopkins should be fine to handle his usual workload Sunday in Indianapolis. Hopkins caught six of 10 targets for 86 yards in Sunday's 27-22 loss to the Giants. Analysis: While Hopkins battled three separate injuries in practice this week, he wasn't on the pregame injury report. The physical wide receiver thought he had a six-yard touchdown in the fourth quarter, but it was brought back due to a holding penalty and fellow wideout Will Fuller ended up scoring from that same distance two plays later. Hopkins has 20 catches for 274 yards and a touchdown heading into a Week 4 matchup with the Colts. Hopkins (thumb, ankle, hamstring) does not carry an injury designation for Sunday's game against the Giants. Analysis: Hopkins was limited at practice this week due to a trio of evidently minor issues, but he'll be out there Sunday and is in line to see his normal steady allotment of targets. He's logged 11 looks in each of the Texans' first two games this season, resulting in a total of 14 catches for 188 yards and a TD in that span. Hopkins (thumb, ankle, hamstring) remained limited at practice Thursday. Analysis: The hamstring notation is a new one, so Hopkins' participation level/injury designation Friday will be worth monitoring. Still, despite his trio of issues, there's been nothing to suggest that the wideout's Week 3 status is in peril. Hopkins was a limited participant at Wednesday's practice with thumb and ankle injuries. Analysis: Hopkins was listed on the injury report last week with a foot issue, managing three consecutive limited practice sessions prior to posting six catches for 110 yards and a touchdown in the Texans' 20-17 loss to the Titans. He apparently hurt his thumb somewhere along the way, but it shouldn't prevent him from playing Sunday against the Giants. Hopkins nabbed six of 11 targets for 110 yards and a touchdown during Sunday's 20-17 loss to Tennessee. Hopkins (foot) is listed as active for Sunday's game against the Titans. 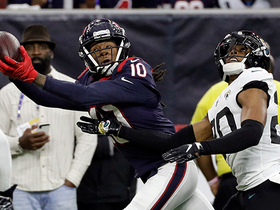 Analysis: As long as he stays healthy enough to play, Hopkins is on track to remain the focal point of the Texans' passing game, a role that typically results in a steady and high target volume for the wideout. Though Hopkins (foot) and fellow wideout Will Fuller (hamstring) are listed as questionable on the Texans' Week 2 injury report, both are expected to play Sunday against the Titans, Aaron Wilson of the Houston Chronicle reports. Analysis: Official confirmation on that front will arrive prior to Sunday's early slate of games, but barring something unexpected, Hopkins should be available to handle his usual high-volume role in the Texans' passing game. Hopkins (foot) remained limited at practice Thursday. Analysis: Drew Dougherty of the Texans' official site relayed footage of Hopkins working at practice Thursday and the wideout seemed to be moving around well enough. We'll have to see if Hopkins draws a "questionable" designation for Sunday's game against the Titans, or is removed from the Texans' Week 2 injury report altogether come Friday. Hopkins was limited at practice Wednesday with a foot injury. Analysis: Per Aaron Wilson of the Houston Chronicle, Hopkins "looked mobile" during Wednesday's practice, which hints that the wideout's limitations may have simply been maintenance-related. The expectation is that Hopkins will turn in a full practice by Thursday or Friday, which would clear up any concern about his status for Sunday's game in Tennessee. Hopkins nabbed eight of 11 passes for 78 yards during Sunday's 27-20 loss to New England. He also lost seven yards on a carry. Analysis: It was a fairly quiet debut for the star receiver, but the fact that an eight-catch performance comes across as ho-hum is evidence of how special he is. Hopkins' yards per game dropped by less than a yard with Deshaun Watson out last season. That should be a sign that, whoever is at quarterback, Hopkins can produce. His statistical ceiling is tied directly to Watson's development. Hopkins caught his lone target for four yards and played four first-quarter series in Saturday's preseason loss to the Rams. Analysis: Hopkins made his preseason debut Saturday and was targeted on the first play of the game. It was just enough to get a feel for game conditions, working with the first unit and getting hit. The offense wasn't crisp, but the goal of giving Hopkins some snaps was achieved. He'll be Houston's top receiving threat when the regular season kicks off against the Patriots on Sept. 9. Hopkins didn't play in Saturday's preseason game against the 49ers, Aaron Wilson of the Houston Chronicle reports. Analysis: For the second exhibition in a row, Deshaun Watson will be without his top target in the Texans' passing attack. Hopkins' health isn't in question, so he likely will earn some snaps next Saturday against the Rams in order to refresh his rapport with Watson. Coach Bill O'Brien relayed Thursday that Hopkins is on track to have a similar workload in Saturday's preseason game against the 49ers as he had in the team's first exhibition game, Aaron Wilson of the Houston Chronicle reports. Analysis: Hopkins didn't suit up for the preseason opener, so he'll likely play just a drive or two if he dresses at all. O'Brien is looking to ensure his top pass catcher will be healthy come Week 1. Therefore, the sixth-year pro doesn't profile as a viable DFS option Saturday. Hopkins (personal) returned to practice Thursday, Sarah Barshop of ESPN.com reports. Analysis: Hopkins has been away from the team for two days to attend to a personal matter, but as expected, is back in camp Thursday. It was an excused absence, and not a matter that is expected to affect his 2018 outlook. Hopkins was excused from training camp Tuesday and will miss Wednesday as well due to personal reasons, Aaron Wilson of the Houston Chronicle reports. Analysis: Head coach Bill O'Brien confirmed Hopkins' status. The All-Pro wide receiver is expected to return Thursday. Hopkins (calf) said he expects himself and Deshaun Watson (knee) to be the best quarterback and wideout tandem in the NFL during the upcoming season, Sarah Barshop of ESPN.com reports. Hopkins won't play in the Pro Bowl due to a calf injury, Aaron Wilson of the Houston Chronicle reports. Hopkins, who missed the final game of the regular season with a calf injury, finished 2017 with a career-high 13 touchdowns and caught a touchdown pass in a franchise-high 10 different games. Hopkins (calf) was officially ruled out for Sunday's game against the Colts. Analysis: Missing his first career regular-season game was an outcome that Hopkins acknowledged being resigned to earlier Friday. Now that it's official, Braxton Miller is in line to start at wideout for the Texans opposite Will Fuller on Sunday, per the Houston Chronicle. Hopkins (calf) acknowledged Friday that he won't be able to play in Sunday's game against the Colts, Sarah Barshop of ESPN.com reports. Coach Bill O'Brien relayed Thursday that a decision on whether Hopkins (calf) will play in Sunday's season finale against the Colts will be made before game time, Deepi Sidhu of the Texans' official site reports. Analysis: Previous reports suggested that the wideout was likely to miss his first regular-season game since entering the NFL in 2013, but O'Brien fell short of that conclusion. Still, with the Texans sitting at 4-11, we doubt that the team will push Hopkins to play at much less than 100 percent in Week 17. To date, the 25-year-old has logged a fantasy-friendly 96 catches for 1,378 yards and 13 TDs over the course of 15 games. Hopkins (calf) is not expected to play Sunday against the Colts, the Houston Chronicle reports. Analysis: With Hopkins, who is not practicing this week, on track to miss the Texans' season finale, added Week 17 targets figure to be available for fellow wideouts Will Fuller and Braxton Miller. Hopkins did not practice Wednesday due to a calf injury. Analysis: Hopkins has played through toe and foot injuries over the past month and managed to contribute at a high level. The 25-year-old wideout has a career-high 13 touchdowns and needs 144 receiving yards this week against the Colts to set a new career high in that category. Hopkins caught four of six targets for 65 yards and a touchdown in Monday's 34-6 loss to the Steelers. Analysis: Hopkins' six targets represented his second-lowest mark of the season behind the four he saw Week 6 against the Browns. Like that contest, the star wide receiver salvaged his fantasy day with a touchdown. His garbage-time, three-yard score in this one raised Hopkins' career-high total to 13 touchdowns. Owners were lucky to get as much production as they did from him considering Houston finished with fewer than 100 passing yards as a team. Hopkins (toe) does not carry an injury designation for Monday afternoon's game against the Steelers. Analysis: Hopkins practiced in a limited fashion all week, but that was presumably maintenance-related. Despite working around a team context that has been quite fluid this season, notably at the QB position, Hopkins has racked up a fantasy-friendly 92 catches for 1,313 yards and 12 TDs, while leading the league with 168 passing targets. Hopkins (toe) was a limited participant at Friday's practice. Analysis: We'll circle back on Hopkins' status Saturday, but we fully expect him to play Monday afternoon against the Steelers, an outcome that would be confirmed if the NFL's passing target leader (170) approaches the contest minus an injury designation. Hopkins (toe) was a limited participant at Thursday's practice. Hopkins caught four of 13 targets for 80 yards and a touchdown during Sunday's 45-7 loss to the Jaguars. Hopkins (toe) is listed as active for Sunday's game against the Jaguars. Hopkins (toe) is expected to play in Sunday's game against the Jaguars even though he missed practice Thursday and Friday, Adam Schefter of ESPN reports. Analysis: The Texans and Hopkins play in the early wave of Sunday's games so there should be one more note of confirmation, but this news is certainly fortunate for those owning a player you wouldn't sit under almost any circumstance when active. Hopkins (toe) is listed as questionable for Sunday's game against the Jaguars after missing practice Thursday and Friday. Hopkins (toe) wasn't spotted on the field during the portion of Friday's practice made available to the media, Aaron Wilson of the Houston Chronicle reports. Analysis: The Texans will provide an official designation for Hopkins after Friday's practice, when the team will release its final Week 15 injury report. While Hopkins' absence from practice Friday isn't a great sign, Wilson notes that the wideout spoke with reporters Thursday and "made no indications of not being available" for Sunday's game against the Jaguars. Hopkins (toe) did not practice Thursday. Analysis: Hopkins was added to the Texans' injury report Thursday, so his status is worth monitoring as Sunday's game against the Jaguars approaches. A return to practice Friday, in any capacity, would no doubt soothe the concerns of those planning to roll with Hopkins in Week 15 fantasy lineups. His 88 catches and 1,233 receiving yards in 13 games to date are bested only by Pittsburgh's Antonio Brown (99 catches for 1,509 yards). Meanwhile, Hopkins leads the league with 11 receiving TDs. Hopkins caught 11 of 16 targets for 149 yards and two touchdowns while losing a costly fumble in Sunday's 26-16 loss to the 49ers. Hopkins caught eight of 14 targets for 80 yards in Sunday's 24-13 loss to Tennessee. Hopkins (foot) returned to a full practice Thursday. Analysis: Hopkins is good to go Sunday against the Titans and poised to continue to serve as a high-volume target in the Texans' Week 13 offense. Through 11 games, Hopkins has recorded a fantasy-friendly 69/1,004/9 stat line, while logging a hefty total of 125 targets in that span. Hopkins (foot) is listed as a limited participant for Wednesday's practice. Hopkins caught seven of 10 targets for 125 yards in Monday night's 23-16 loss to the Ravens. Hopkins (foot) was absent from the Texans' final injury report after logging a full practice Saturday. Analysis: Head coach Bill O'Brien limited Hopkins' practice workload Thursday, but remained confident the team's No. 1 wide receiver would be ready for Monday's game against the Ravens. It appears as though he was correct with his optimism, as the 25-year-old pass catcher is set to play Monday assuming he avoids any setbacks. Hopkins (foot) was a limited participant at Friday's practice. Analysis: Hopkins was a limited participant for the second consecutive practice Friday, but head coach Bill O'Brien remains confident that Houston's top wide receiver will be ready to go Monday against Baltimore' second-ranked passing defense. Hopkins (foot) was listed as a limited participant at Thursday's practice. Analysis: Despite the wideout's listed limitations at practice, coach Bill O'Brien noted Wednesday that Hopkins is slated to play Monday night against the Ravens. "He's all right," O'Brien said of Hopkins. "He rode the bike a little bit. He'll be there Monday night." We'll track Hopkins' status as the week continues, but it's plausible that he could end up without an official injury designation upon the release of the Texans' final Week 12 injury report, which is due Saturday. Hopkins wasn't at Wednesday's practice, but he's expected to be ready for Monday's game in Baltimore, Aaron Wilson of The Houston Chronicle reports. Analysis: Presumably dealing with an undisclosed minor injury, Hopkins rode a stationary bike while his teammates practiced Wednesday. Head coach Bill O'Brien said Hopkins will be ready for Monday's road matchup with a Baltimore defense that has limited wide receivers to 6.3 yards per target and five touchdowns in 10 games. Only the Jaguars have been tougher on Hopkins' position. Hopkins nabbed four of nine targets for 76 yards and a touchdown during Sunday's 31-21 win over Arizona. Hopkins caught seven of 14 targets for 111 yards in Sunday's 33-7 loss to the Rams. Hopkins caught six of 16 targets for 86 yards and a touchdown in Sunday's 20-14 loss to the Colts. Analysis: Hopkins hauled in a 34-yard score with 6:11 to play in the fourth quarter, then almost helped his team complete the comeback on the final drive but narrowly avoided getting both feet down in the end zone on a 17-yard pass. While Tom Savage is a clear downgrade from Deshaun Watson (knee) under center, Hopkins should still provide plenty of value the rest of the way thanks to his elite ball skills and massive target share. 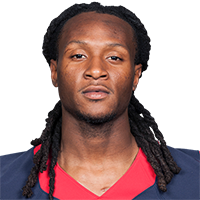 Hopkins is expected to see plenty of volume in the pass game with the Texans turning the keys to the offense in the Week 9 matchup with the Colts over to Tom Savage, who has thrown 34 percent of his career passes in the veteran wideout's direction, Mike Clay of ESPN.com reports. 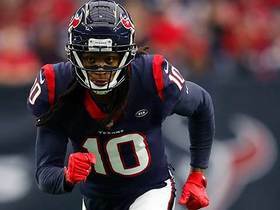 Houston Texans wide receiver DeAndre Hopkins discusses his team's stellar 2018 season and promising future. 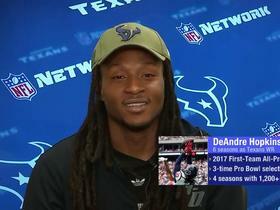 NFL Network's James Palmer discusses what makes Houston Texans wide receiver DeAndre Hopkins a game-changing athlete. 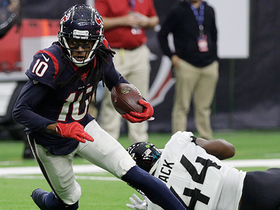 Houston Texans wide receiver DeAndre Hopkins discusses everything heading into Wild Card Weekend. 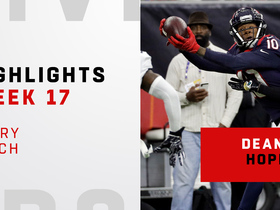 Watch every catch from Houston Texans wide receiver DeAndre Hopkins vs. the Jacksonville Jaguars during Week 17 of the 2018 NFL season.